Kirkland fort lies about half a mile to the East of Kirkcudbright and just off the B727. It's only really discernable once identified on the ordnance survey map, and blends in with the surrounding countryside. Above. Kirkland Fort looking South East. The above photo shows a South Easterly view of the fort, with the scooped 20 foot summit laying hidden beneath the gorse bushes ( left hand side of the photo) The second part of the scarped summit can be seen just to the right, again covered in gorse. The gorse bushes grow around the rim of the top of the fort, measuring around 90 by 85 feet. Aerial photos show the full extent of the layout of the fort, neatly outlined by the gorse. Above. The summit of Kirkland Fort looking North East. Above. Another view of the fort looking South East. The gap in the gorse bushes would appear to be an entrance way into the fort, about 20 feet wide. Ditches and banks still survive only on the Southern side of the fort. This is not considered a good example of a rock cut fort owing to its position with higher ground on nearly every side. Above. Sketch and plan view of Kirkland Fort. Kirkland Fort is regarded as perhaps one of the simplest forms of fort......a man-adapted naturally occurring outcrop of rock, scooped\quarried in its centre, with simple ramparts cut from the surrounding rocks and earth. It may be small, but it's perfectly formed....Stable Isle (also known as Rough Isle) lies at the Southern end of the now drained Loch Fergus, less than a mile North West of Kirkcudbright. This small island was part of a larger, lake bound, complex that was once the seat of the Lords Galloway. The site as a whole, including Palace Isle ( to the North) was the site of Castle Fergus. Above. Stable Isle from the North. Stable Isle is the smaller of the two islands, and seems to be linked with Palace Isle by an earthen causeway. The aerial shots of both Stable and Palace Isles on both Multimap and Googlemaps are excellent, and show the islands themselves, the surrounding ramparts and the remains of causeways. A number of historical documents seem to have the two islands names mixed up....which is possibly the reason that only Stable Island appears as a named entity on the Ordnance Survey maps. For such an unassuming site, this is really a very important part of Southern Scottish history. Palace Isle (along with Stable Isle) once housed Castle Fergus, the seat of the Lords Galloway, and reputedly the first Norman castle in Scotland. It was built by the first Lord of Galloway, Fergus, who held sway over much of South Western Scotland in what is now modern day Kirkcudbrightshire and Wigtownshire. Fergus was a great patron of the Scottish church, and enjoyed good relations with the Scottish King, enabling him and his family to remain in power and rule relatively peacefully until the death of King David I. Above. Palace Isle looking South. Palace isle is nearly 240 metres long from North to South, and roughly 105 metres wide (at it's widest point) from West to East. There are earthen remains of a causeway at the North Eastern side, though I'm not sure if this is contemporary with the castle or is a more recent addition. Above. Looking towards the remains of the causeway. Palace Isle is split roughly into two parts. The Northern most portion is roughly circular, and is surrounded by banks and ditches that must have added the defensive qualities of the site when surrounded by water. To the South, is a longer and narrower raised platform, separated by a ditch running West to East. There is no evidence of an earthen causeway linking the two islands together....perhaps there was a wooden causeway or bridge here. Above. Panoramic shot of the fort looking South. This must have been an impressive site in its heyday....a large island in the middle of the loch, suitably protected by the surrounding waters and with whatever buildings that may have existed here. This would indeed have been a palace suitable for a Lord with dynastic ambitions. Above. Another Southerly view of the fort. Above. The earthworks from the West. Above. Close up view of the banks and ditches at the West side of the fort. Above. The fort looking East. Above. Another Southerly view of the earthworks. The Old Kirkcudbright website tells us that the 'castle' that existed here, was of a Norman design, with towers at each corner and high walls....though no other accounts of the time describe the fortifications as such, or indeed in any way. Upon Fergus' death, he was succeeded by his youngest son, Uchtred, who is reputed to also have taken up residence in the castle or palace at Fergus. Uchtred jointly ruled Galloway with his brother Gilbert (Gille Brigte) but their relationship was one of typical brothers....they fought about everything, and when the Scottish King William was captured by the English at the battle of Alnwick in 1174, Gilbert accused Uchtred of being a traitor and being responsible for the King's capture. Gilbert followed Uchtred back to Castle Fergus and murdered him there, mutilating his body in the process. Gilbert took complete and sole control of the Galloway lands from this moment on, choosing to reside at Castle Fergus as his brother and father had done before him. Gilbert eventually died in 1185, but only after killing and driving out as many Norman settlers as he possibly could, building up a predominantly Gaelic following and therefore alienating himself and Galloway from both the Scottish and English Kings. 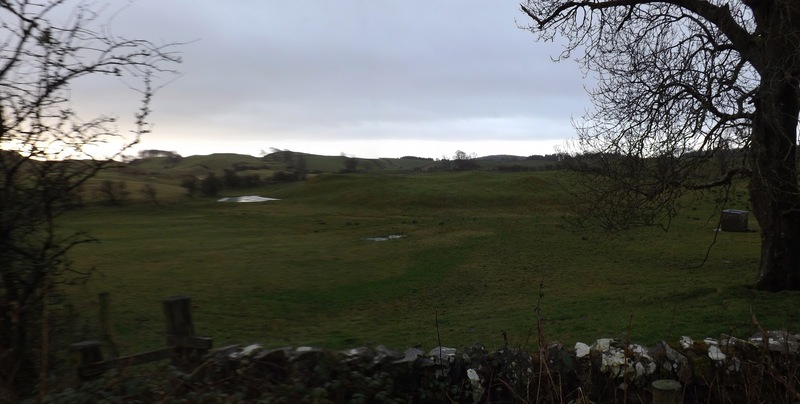 He was succeeded by Uchtred's son, Roland, who set about making his Lordship secure against both the English and the Scottish, by building many fortresses around the Kirkcubrightshire area, including Buittle, Kenmure and Motte Brae in Kirkcubright. There appears to be no evidence that Roland, or his successor, his son Alan, resided at Castle Fergus, and the site slowly slips from historical record. It's possible that it was dismantled along with many other fortifications in Scotland, when King Robert the Bruce regained control of huge swathes of land from the English. Whatever buildings were still standing, were burned down by Thomas Huthinson in 1499. In 1570, some stone walls were still standing, and were subsequently quarried and removed by the MacLellan family to provide stone for the castle in the middle of Kirkcudbright. The site is easily accessible from the roadside and there are a few places to park safely.